A new A500/2000 chip ram product from Jens. Interesting as it disables on board chip ram and it's 2MB is fully self contained. Odd pricing model though. Due to the varying price, the product may be shown as "out of stock" temporarily. Just come back a few hours later. 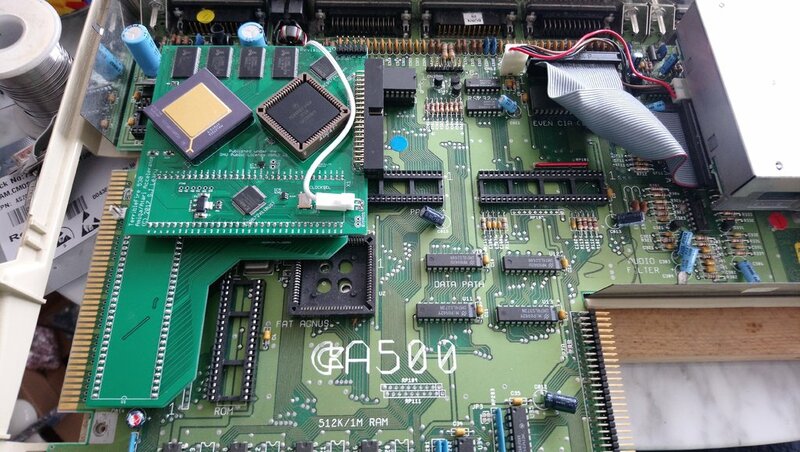 I think the ACE2, DKB and MegiChip, or similar are the only products that will get 2B/M Chip Ram on an A500/2000. This may be a cheaper alternative but it won't give you 2M/B chip on a Rev 6A MB. So, I guess if you want 2M/B Chip Ram, this might be one of your last chances to get that capability. I like the idea. I sold the MegaChip from my A2000 (btw, I got more than $180), so this price is reasonable). It would be nice if it let you map the unused trapdoor memory as Slow RAM in the "Ranger" $c0 address space like it originally functioned. A few stupid old bits of software from the 80's assume that "extra memory" lives there and only there. Very clever, actually! It is nice to still have this kind of hardware available! I have a second A2000 that I am repairing - I may order this in the future. I don't think there is anything wrong with the pricing. Jens works his tail off on these products and deserves to be able to make a living. Interesting board. Certainly useful for updating ECS-level machines. I see this is a "one time only" production run, probably NOS chips he got a few years back. But interestingly, here’s another MegaChip project over at AmiBay. Limited run due to availability of Agnus chips. However, it doesn’t come with a PLCC adapter socket. You have to remove the Agnus socket and solder a cludged female socket-set to the motherboard. Daunting task! And the AmiBay adapter does not support GenLock. Jens’ product does. And I think Jens put a lot of thought into his product. That's pretty much another form of Tuxbar's (also on Amibay) Megachip... removal of the socket and placement of the megachip directly to the board. I have done this myself on one of my 500s (using Tuxbar's variant). What's great about this, versus using the PLCC socket adapter, is that you don't have any interference from the megachip when using a 68000 socket-based accelerator. With the ACE2 and other Megachip variants, you'll have to use a CPU relocator to use both it AND an accelerator. What's great about this, versus using the PLCC socket adapter, is that you don't have any interference from the megachip when using a 68000 socket-based accelerator. With the ACE2 and other Megachip variants, you'll have to use a CPU relocator to use both it AND an accelerator. Great point! I have that problem with one of A500's now. I have an HC533 socket-based accelerator with no way to use it with a MegaChip (keyboard won't fit). But I also have an Indie ECS (the Indie ECS you can raise up though). I have NOT seen any CPU re-locator that gets around the MegaChip and in between the Indie ECS. Have you Kirk? I've been on the hunt for that. Adding to the physical complexity, I also have an 8M/B ram module under my CPU. 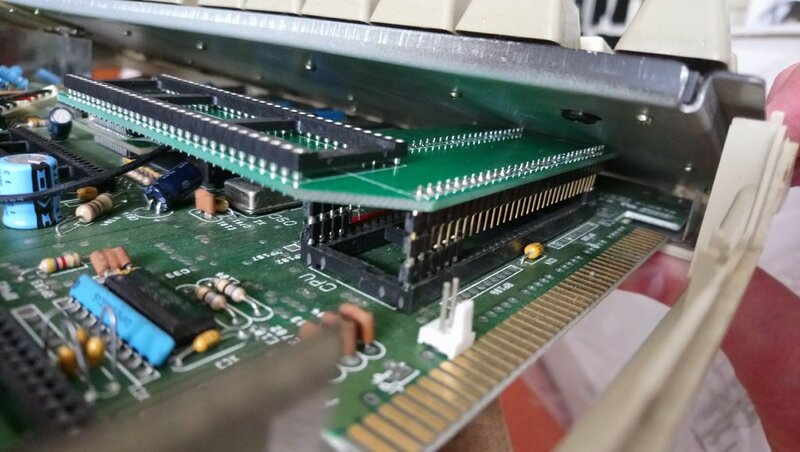 Actually, I can't remember the reason why now, but I don't think I've even tried the HC533 stacked on top of the ram module (or vice-versa). I haven't messed with any of my stuff since the "great lights out". No, I haven't seen a CPU relocator that takes all of that into account, unless, of course, the ones that are set at a 90 degree offset will do it. Unfortunately the 90 degree adapter doesn't go back far enough to clear the Agnus chip either. I might could raise it up too maybe. I wish there was one that sat back more towards the Gary chip. This is one of my projects when it gets cold again. I decided to get one of these just for the sake of trying it out with my A500 in my plexi case. I like supporting these things too. 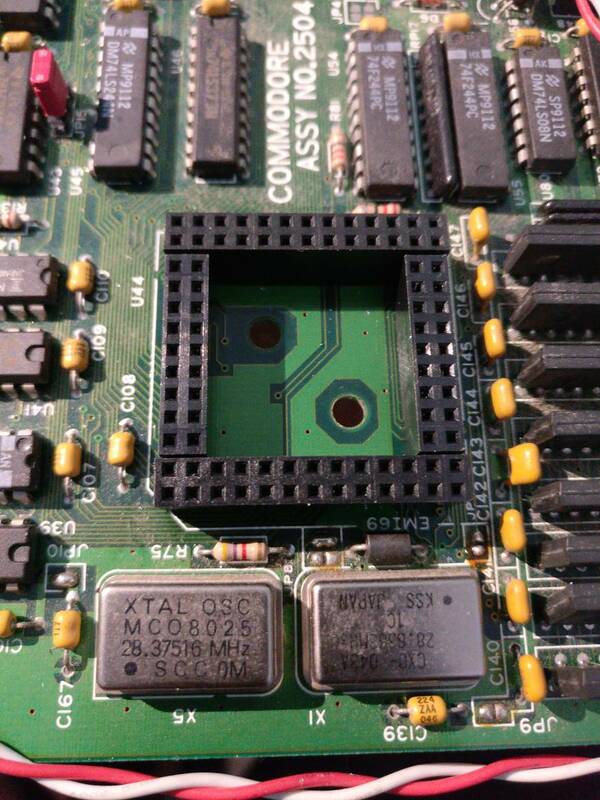 @Gizmo - add an extra row of pins in the 68000 socket. I have a Megachip, Indivision ECS, and VXL*30 all stacked into my case, keyboard fits fine. Even with the extra fan and heatsinks I added on top of the VXL. Come to mention it though, I probably shouldn't have done all that overclocking, since now my VXL-RAM board doesn't work right. Or it might just be a bad ram chip. Oh well, maybe will have time to look at it in a few years. @Mike....... yea, I have to get re-motivated to fit that HC533. I have a bunch-o-riser pins to try again. Oh man, don't let your VXL*30 go to waste! Sounds like you're busier than ever!